The LTTE, struggling to thwart the army on the Vanni front is facing the prospect of large scale military action on another front. The army is on the offensive in the general area west of Omanthai, with the current focus being the area south of Adampan, an LTTE stronghold now under intense pressure. The LTTE is believed to have shifted some of the experienced units from the Vanni front for re-deployment along the Muhamalai line and elsewhere. Authoritative military officials said that this was due to their belief that the army would make a thrust across the northern front. 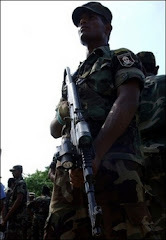 The launch of large scale operations on another front is expected to cause serious difficulties to the LTTE, particularly at a time it is experiencing a severe shortage of ammunition. Military Spokesman Brigadier Udaya Nanayakkara yesterday said that ground troops were making good progress on the Vanni front. "We have inflicted sizeable losses on the enemy over the past several months and they are being forced to re-think their strategy," he said. According to him, the LTTE had replaced some of the experienced units with fresh recruits and women cadres. Nanayakkara said that the LTTE was in the process of re-deploying units, strengtheing positions, particularly the Muhamalai line. He said the ongoing offensive action on the Vanni front wasn’t aimed at capturing land. Ground troops were in the process of inflicting maximum possible losses on the enemy both in terms of personnel and material, he said. Although the army’s intention wasn’t to regain land, the LTTE in some instances had vacated villages, he said. A case in point is the recent vacation of an LTTE camp at Thampane, which Nanayakkara called ‘Vietnam Base’. Army Chief Lt. Gen. Sarath Fonseka has committed sizeable forces to Vanni front. Fonseka last Friday toured Weli Oya and Vavuniya to assess the status of the operations that were being carried out in the region as part of the overall strategy to weaken the LTTE’s capacity to wage war in the Vanni. Nanayakkara said that the LTTE had been losing about ten cadres on a daily basis and on some days their losses doubled. On Saturday, the ground troops killed at least 14 LTTE cadres in separate confrontations at Periyathampanai and Kallikulam. The military said that Bhanu and Swarnam, who unsuccessfully tried to thwart the army offensive which brought the Eastern Province under government control, were in charge of some the formations deployed in the northern theatre. Balraj is believed to be in charge of Weli Oya sector with Theepan in overall command of the northern front. The service chiefs have assured the Defence Secretary that the ongoing operations were progressing as planned. The military is confident that the LTTE wouldn’t be able to sustain resistance at the current level for much longer. Police asserted that the recent deliberate attacks on civilian targets, too, could be part of their strategy to pressure the government slow down the offensive action.